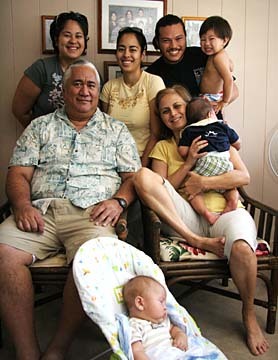 The Laimana family, clockwise from bottom, grandson Julian Estrella, John Laimana, Jenny Estrella, Jamie Walk and husband Ka'ano'i Walk with son Kapiko, and John Laimana's wife, Lei, with grandson Kalai Walk. 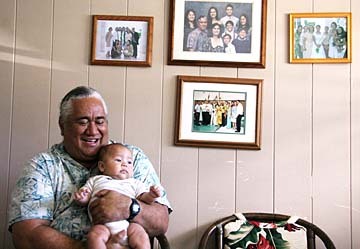 Going back to school started as a family affair for the Laimanas of Kaneohe. It's father John who's taking it one step further. With the help of a Hawaii Community Foundation scholarship, Laimana, a nontraditional student in his 50s who used to run his own waterproofing contract business, will graduate at the end of the University of Hawaii-Manoa's spring semester with a bachelor's degree in Hawaiian studies. He hopes to receive another scholarship in time to pursue his master's degree. He'll be joined by his wife, Lei, who will be going back to UH to earn a bachelor's in Hawaiian studies as well -- that is, when she isn't working in the office of King Intermediate School. The couple share a cozy family home with three of their seven children, 27-year-old Jennie, 25-year-old Jamie and 17-year-old Jerrick (and, yes, their other children's names start with a J as well). Jennie and Jamie are both married, so their husbands and a total of four Laimana grandchildren are also part of the household. It was daughter Jamie who led the journey back to school, inspired by the family of her husband, Ka'ano'i Walk. His parents are Hawaiian educators. "And I knew my family were all interested in Hawaiian things, so I felt I could be persistent enough to get them to go back to school." After some bit of "designing," as John describes his daughter's schemes, Jamie finally got her dad, mom and grandmother, Jane, registered at Windward Community College, and secured financial aid. John and Lei graduated in 2006, and Jamie and her grandmother a year later. Jane completed the requirements for a Hawaiian-language certificate but died soon afterward. A family who studies together stays together. John Laimana plays with grandson, Julian Estrella. "One comment I remember she made before she passed away was, 'Going back to school opened up a whole new world for me, even learning new things about Hawaii,'" John said. "She always enjoyed interacting with the students in her classes. They used to call her Grams." While John jokes that his children all seem to be slowly moving back to the Kaneohe homestead, he does carpool to the Manoa campus with son-in-law Ka'ano'i, a student at the Richardson School of Law. "He pays for the parking pass, and I do the driving," he says. When he's not at school, John volunteers at Iolani Palace and coaches youngsters in basketball at Kaneohe District Park. JOHN says his sociopolitical views have gone through a 180-degree change since he went into Hawaiian studies -- from "Republican conservative businessman to a liberal leftist." His opinions and field of study put him in occasional conflict with his sister, who lives in Utah, and mother-in-law. But it was researching his genealogy as part of his Mormon faith that initially sparked his interest in his Hawaiian heritage. Jennie remembers asking her father as a child why she had to go to school, and his replying, "Cause you're dumb!" Nowadays, she says with a laugh, she's able to turn the joke turned back on them. But her folks aren't so much "dumb" as surprisingly competitive with one another. "Since we're older students, we come back with a purpose," John said. And they're thankful for the financial help they've received from the Hawaii Community Foundation -- in particular, Judy Oliveira, who used to oversee the scholarship program. "She's done a lot for our family," John said, "and she was the one who challenged my kuleana, (to) get out of my 'safe box.'" "Going to college after high school and going to college now is a lot different," Lei said. "My husband and I have gone through a lot more in life, and I've learned how to multitask. In fact, when it comes to school, we're there all the time." "And if there was one thing I wanted to emphasize," John added, "it's that older Hawaiians like myself should go back to school. There's plenty of money out there that they can use." Saturday is the deadline to apply for postsecondary school scholarships available from more than 150 sources at the Hawaii Community Foundation. To apply online visit hawaiicommunityfoundation.org. Call 537-6333. Rona Kekauoha is the current scholarship officer for the Hawaii Community Foundation. This story mentions the previous officer, Judy Oliveira, who helped the story's subject, John Laimana, with his scholarship. For more information about scholarships, call 566-5570 or toll-free from the neighbor islands, (888) 731-3863.